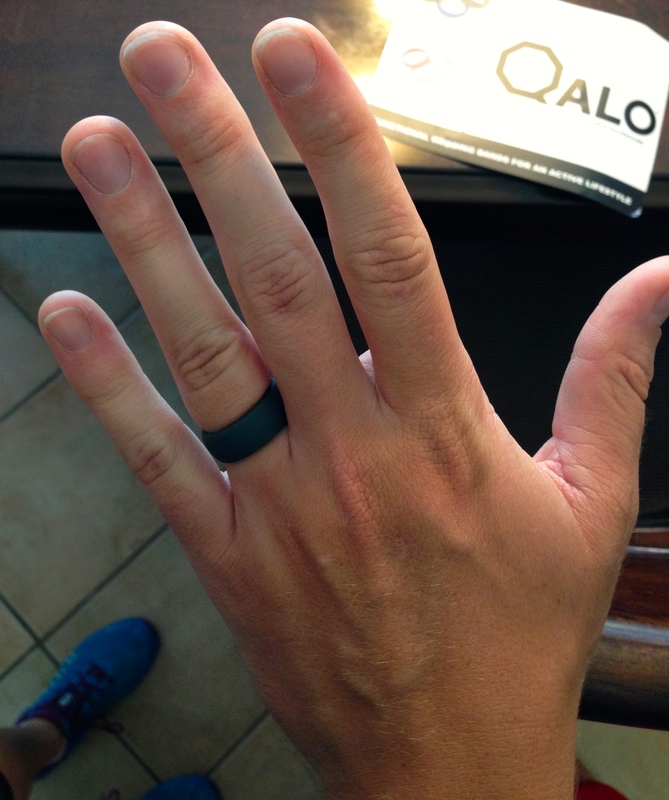 Ever since beginning Crossfit, I’ve worn my wedding bands less and less. There are a few reasons for this. 1. They don’t fit anymore. 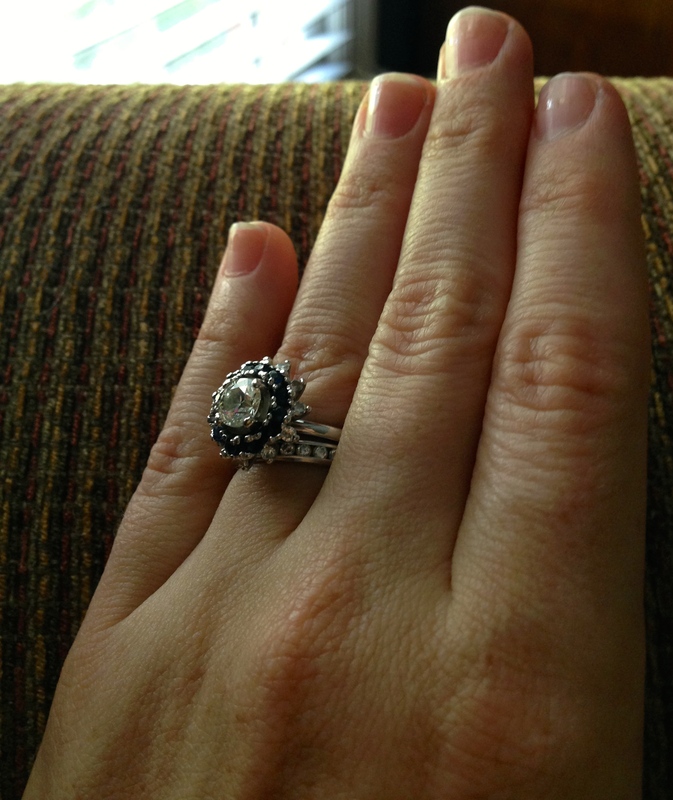 I’ve had my engagement ring and wedding band resized twice in the last few years because of weight loss (hooray). They are both too big again but I’m a little lazy when it comes to taking them to be resized again so usually, unless we are going somewhere fancy, I just leave them in my jewlery box. It’s a beautiful set which I treasure immensely. I will probably make a point to have them resized one last time before Christmas. The engagement ring needs to be serviced/cleaned anyway. 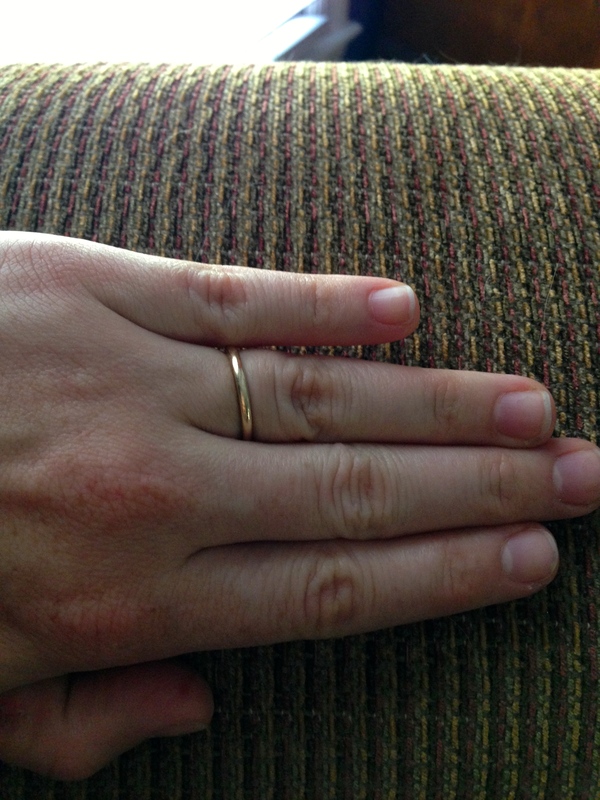 Instead, I often wear a “stand in” smaller gold band that belonged to my great grandmother. I treasure it as well, because of who wore it before me, and how indestructible it feels. It’s simple and strong and I tend to wear it to work and sometimes when I work out if we don’t do a lot of barebell or bar work. Plus, it actually fits me without falling off. 2. 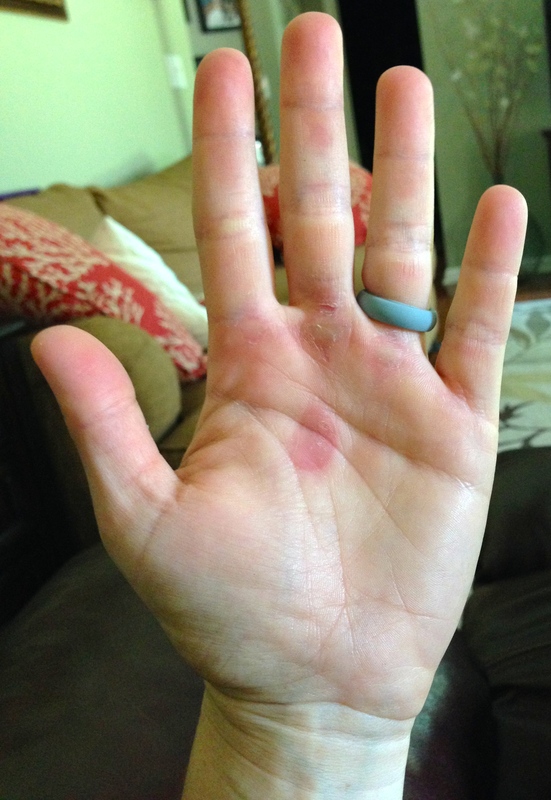 Wearing any rings on your hands during Crossfit workouts is just not a great idea. I’m always so surprised to see certain woman wear their full sets. I mean, go for it if you want! In my experience, it tears the precious metals up and you run the risk of losing it (in my case, it would slip right off and I wouldn’t notice). So, a lot of athletes take their rings off for their workouts. I just tend to avoid wearing mine on days I know I’m going to the gym because I don’t want to run the risk of losing it. They come in a few different colors. Rob wanted dark grey (and he ordered a medium). I wanted light grey, and I also ordered a medium. I probably wear a 6. Not sure what Rob wears, maybe a 10? Mine slides on easily but the material creates a very secure fit so it’s not loose in any way. And it’s incredibly comfortable! I hardly realize its there. (so sorry for my gross hand). I’m looking forward to wearing these through a workout; I don’t anticipate I will even notice it’s there because the rubber is so pliable and soft. I would recommend these to anyone who leads an active lifestyle or anyone who works with their hands in tough situations. When Rob is not crossfitting, he’s usually turning a wrench on a car in our garage, so these make great rings for guys who work on cars too! 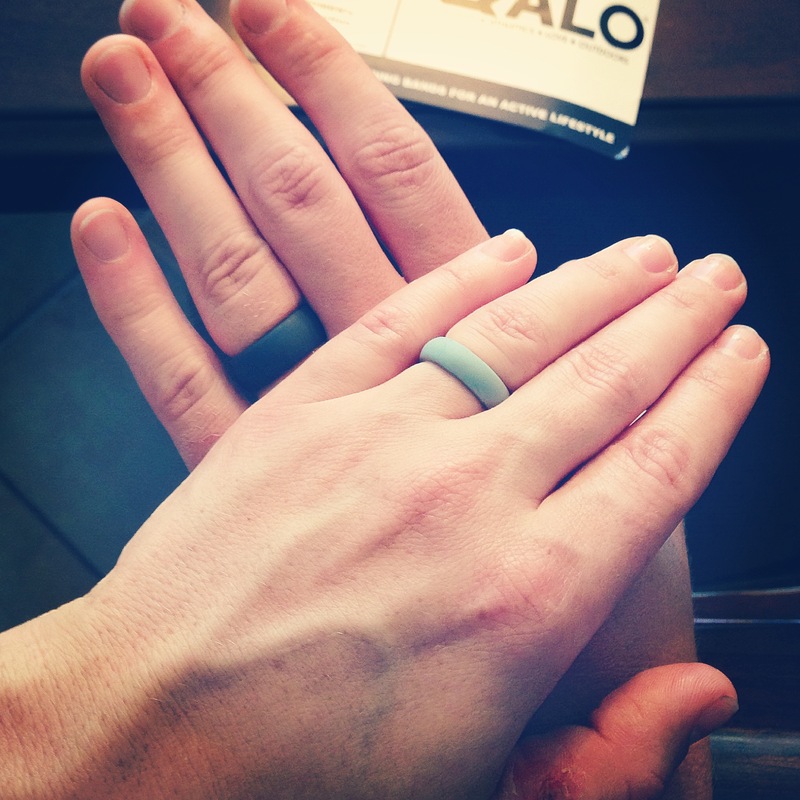 It sounds cheesy, but I’m so excited we can be “married” again every day now, even doing what we love. Forever strong, forever together.